It’s our second entry in Bearleader’s “Eat a City” series, where we pick a city and hit the road to find great eateries we think you will enjoy. This time we are reporting back from Vienna, Austria. For a major European capital, Vienna is relatively small. With only 1.7 million inhabitants, it is a city that can be easily explore and its old world charm can be absorbed in just a few days. 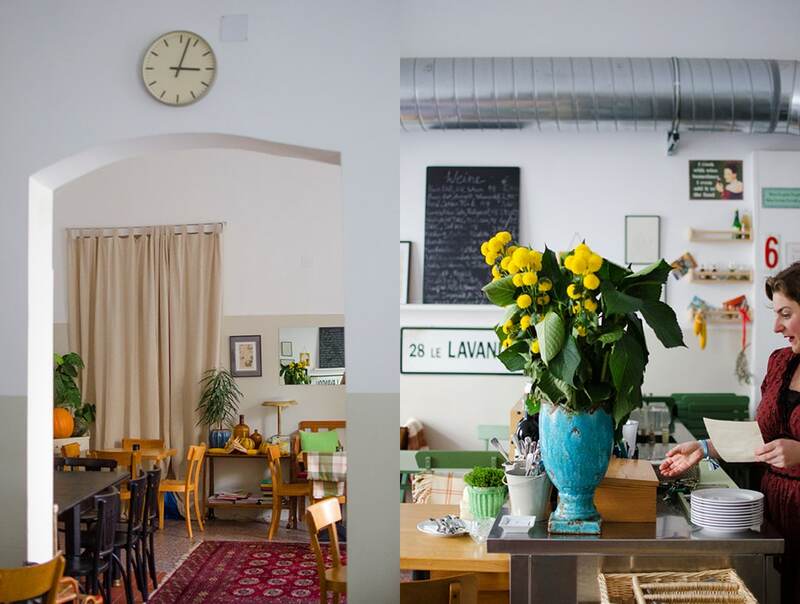 We decided to search for places where you can experience authentic-contemporary-Viennese life, that are frequented mostly by locals. 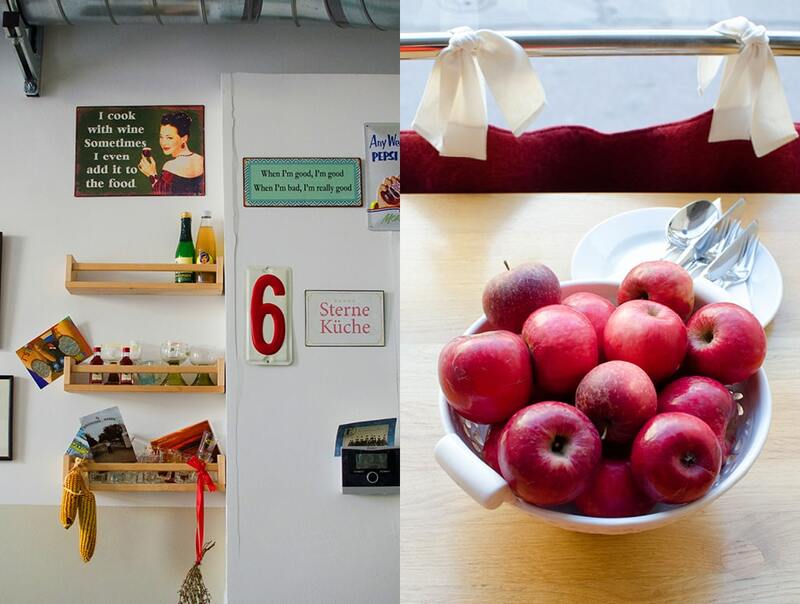 These are places that don’t cater to the familiar Viennese stereotypes. 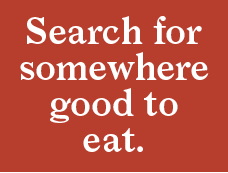 If it’s schnitzel and apple strudel you are looking for, you may want to look elsewhere. The first stop on our culinary tour takes us to Vienna’s 5th district, close to the famed Naschmarkt, the largest open food market in Vienna. The name of this restaurant is a bit of a tongue twister but don’t let it scare you. It’s pronounced Wora-schit’-ski. 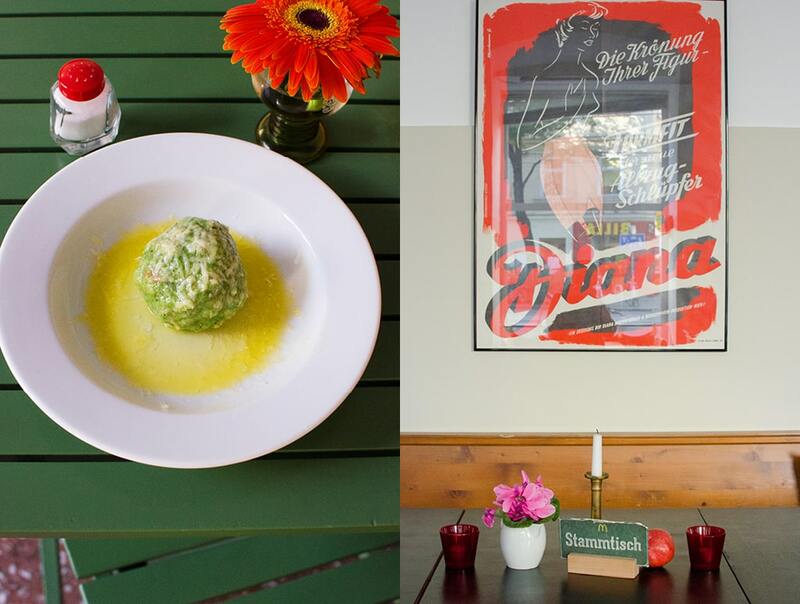 Number 52 Spengergasse was the address of another restaurant for a long time before husband and wife team, Marion and Christoph Wurz, took it over, breathing new life into the place. 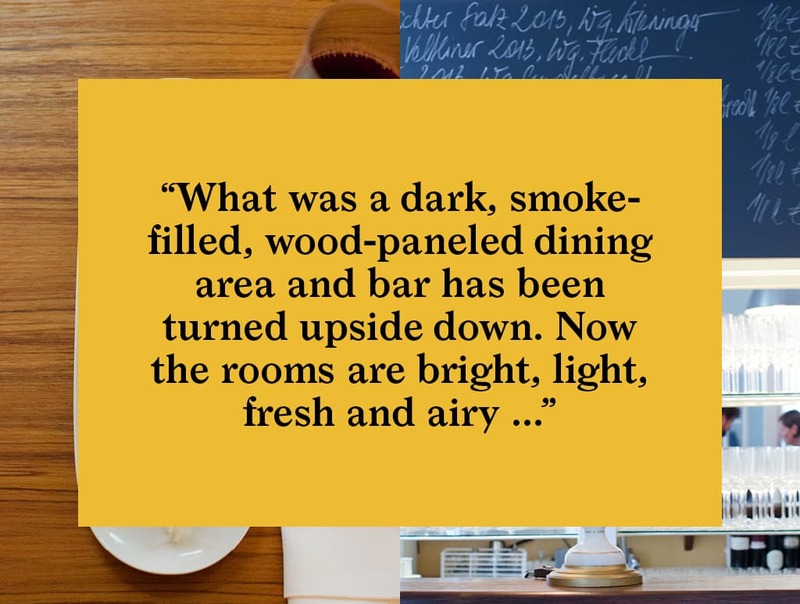 What was a dark, smoke-filled, wood-paneled dining area and bar has been turned upside down. 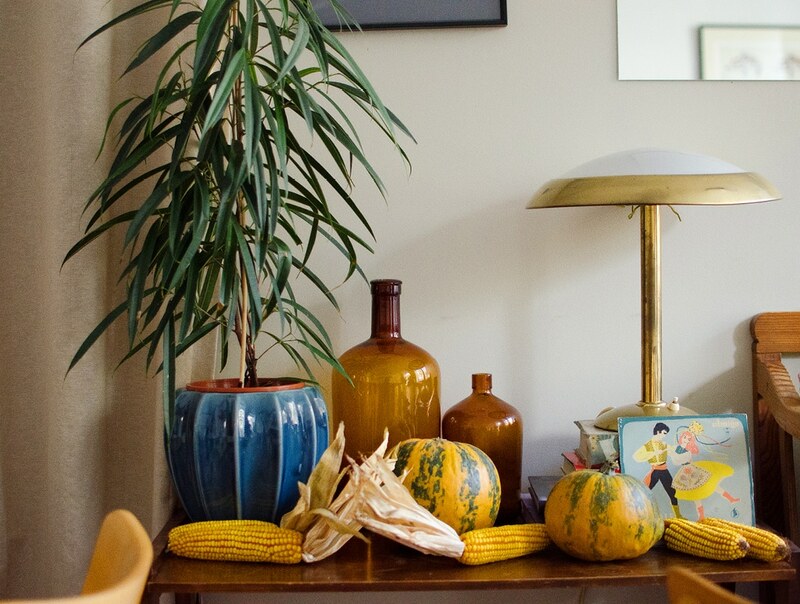 Now the rooms are bright, light, fresh and airy with classic old Viennese chairs and Marion’s flea-market-vintage bric-a-brac finds, lending the rooms an air of eccentricity. 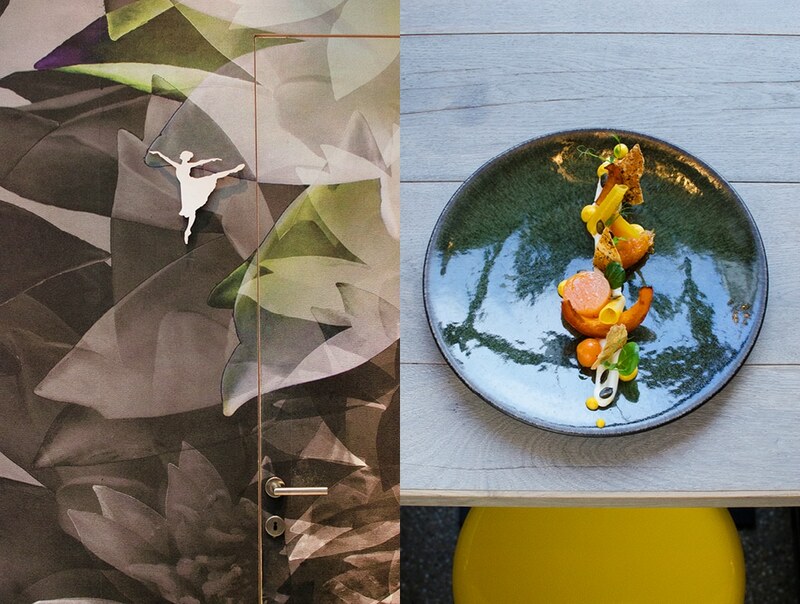 The kitchen is in the experienced hands of young Austrian chef Martin Buzernic, who specializes in local, traditional fare, deconstructed and reinterpreted into fresher and lighter versions. The wine list is Austrian only. Not familiar with the local wines? Just ask Marion for advice. She will know the best pairings for the day’s menu. At lunch hour, the restaurant is full of regulars from the neighborhood taking advantage of a very reasonably priced lunch menu. The crowd is small enough that Marion and Christoph know many of their patrons by name, giving the place the feel of a canteen, but with one important distinction: The food is great. The menu changes daily based on what farmers bring, which you can see announced every morning on Facebook. 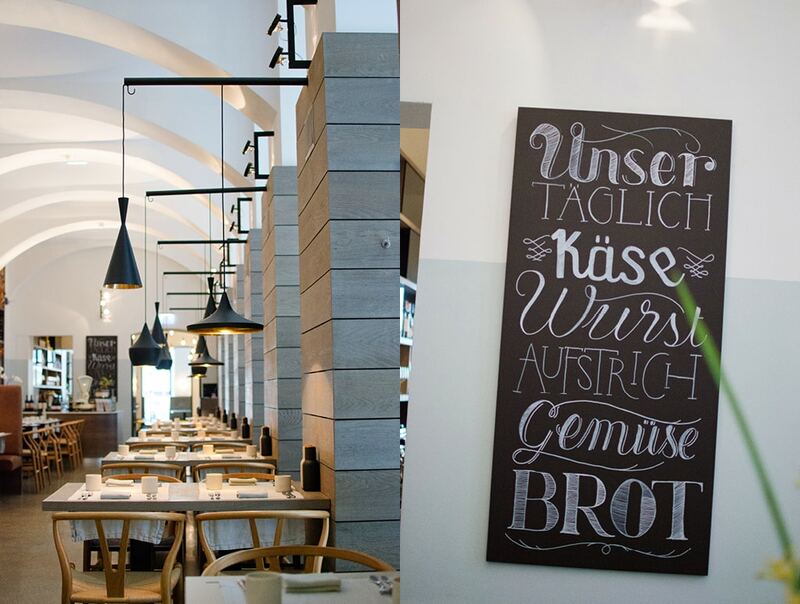 It is written in German, but with a little help from Google translator you can easily evaluate the menu’s general yumminess. Or just show up and use Google’s “I’m feeling lucky” technique and order whatever’s on offer. You won’t be disappointed. In the evening a new menu is handwritten based on the morning’s experiments. The names of the dishes may be unfamiliar but the friendly waitstaff is happy to assist with descriptions and suggestions. 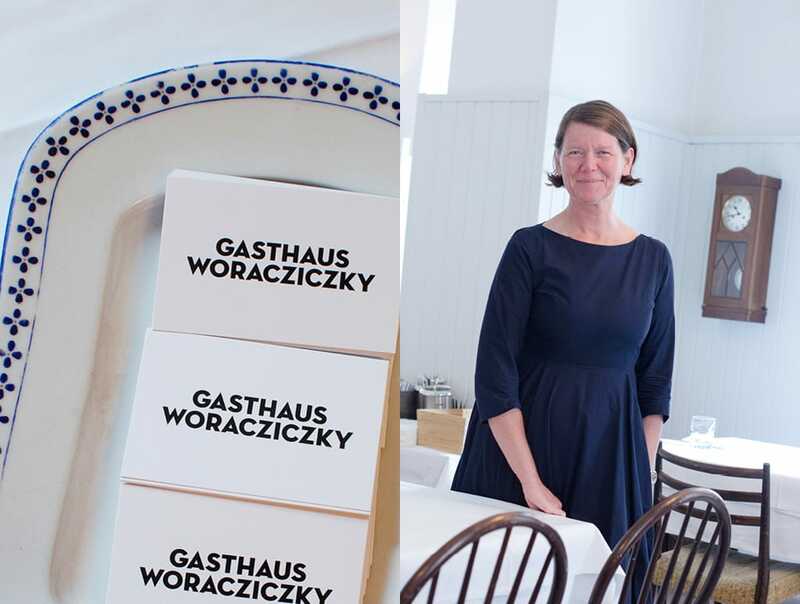 Gasthaus Woracziczky is a true reflection of Marion and Christopher’s warm charm and kind hospitality. It’s a great place to while away a few hours over good food, wine and conversation. Next we visit Zum Finsteren Stern, meaning “to the dark star”. 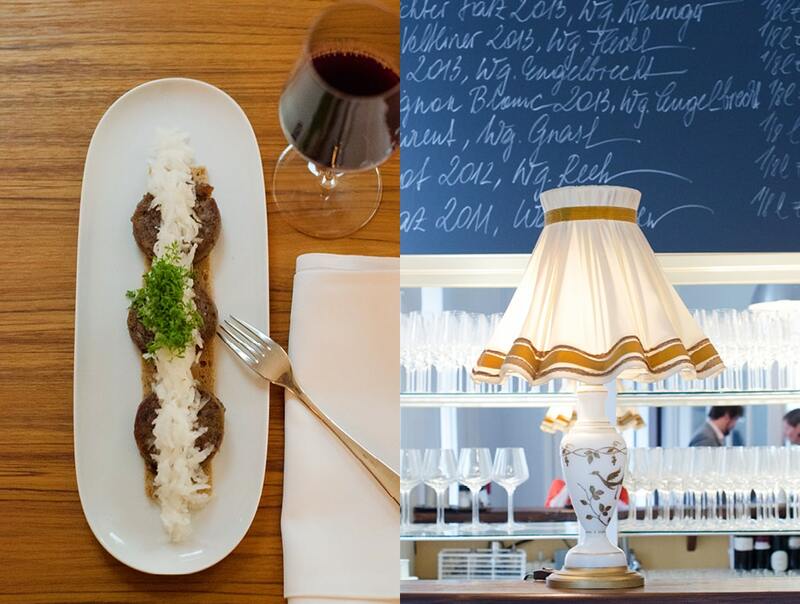 Situated in Vienna’s first district, the restaurant is on the ground floor of a 17th century Palais where in October 1762, a young Wolfgang Amadeus Mozart and his sister Maria Anna gave their first public concert at the invitation of Count Thomas Vinciguerra Collato. Nowadays you won’t likely hear the sounds of Mozart in the air. But you will hear the rhythmic sounds of horse drawn carriages carrying tourists past the restaurant on their tours though the first district: the carriages are, perhaps, the one sound that would also have been familiar in Mozart’s day. 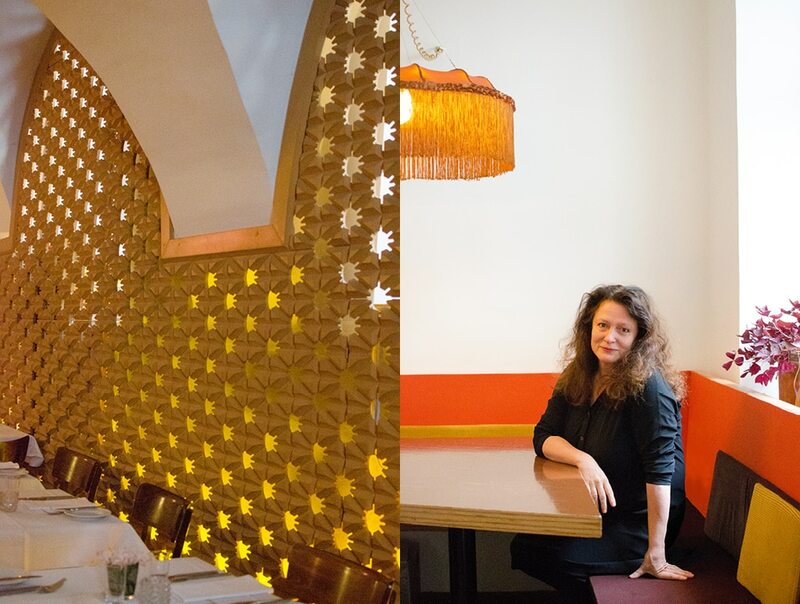 At Zum Finsteren Stern, a former actress, Ella De Silva, now pours her talent into creating great experiences for her audience through food and hospitality. The decor is simple, and direct. Dramatic vaulted ceilings take center stage and in the lower dining room, a series of carved wood panels line one wall, serving both as art installation and light fixture. If your visit to Vienna is during the summer months, be sure you book a table in the beautiful outdoor plaza. The plaza is sheltered by an enormous tree and dining here is cinematic, enjoying Ella’s delicious creations as horse-drawn carriages slowly roll by, the sound of the horses’ hooves echoing through the narrow streets. 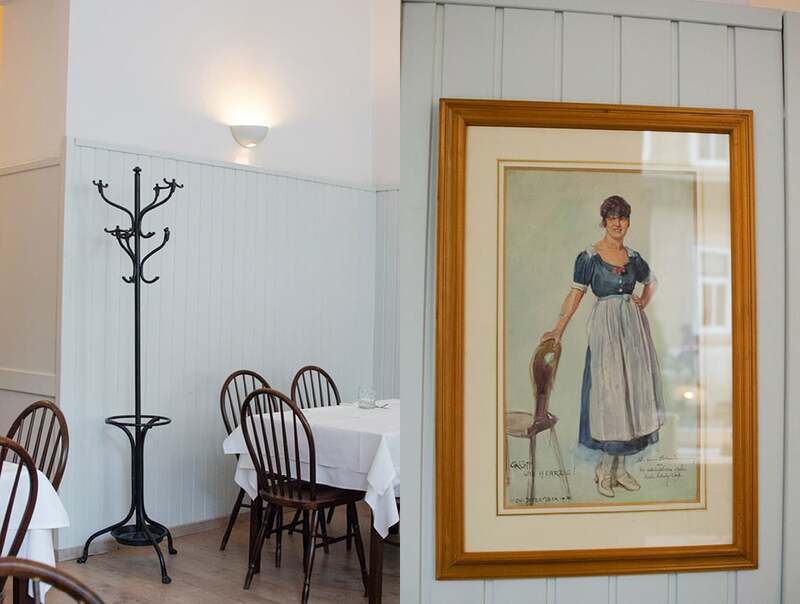 Ella’s menus draw on traditional Austrian ideas with influences from Austria’s southern neighbor, Italy. Fresh local and seasonal ingredients shape her menus. 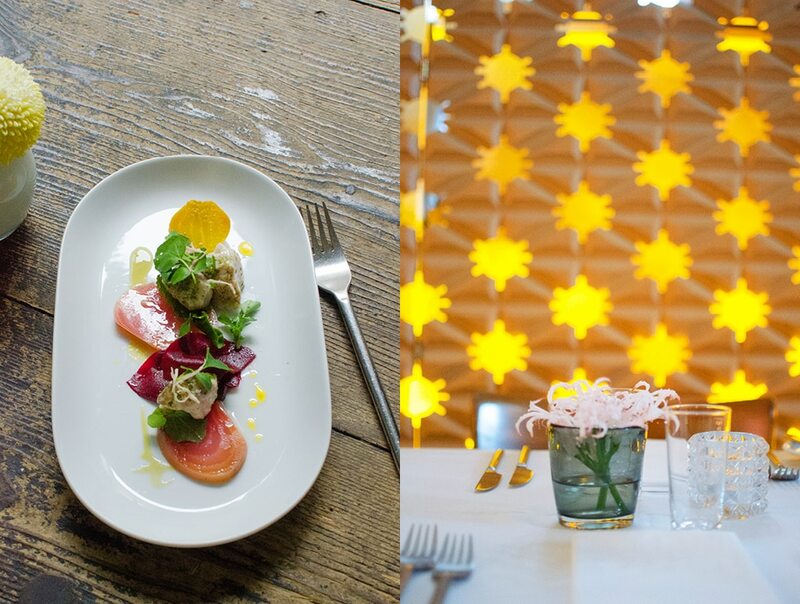 I am lucky to have dined at Zum Finsteren Stern several times, which allows me to give you a bit of an inside scoop. Ella makes a signature dessert called “Schoko Bombe”, a rich chocolate dish served cold. It is quite literally “the bomb”. They go quickly, so ask your waiter to put one aside for you when you order your meal. That way you won’t be disappointed, as I have been more than once. For restaurant number three we head over towards St. Stephens Cathedral. Just a stone’s throw away from the cathedral is Lugeck Square, a medieval plaza that was traditionally designated the emergency meeting place in times of war. Now it’s the home of the restaurant, Labstelle. 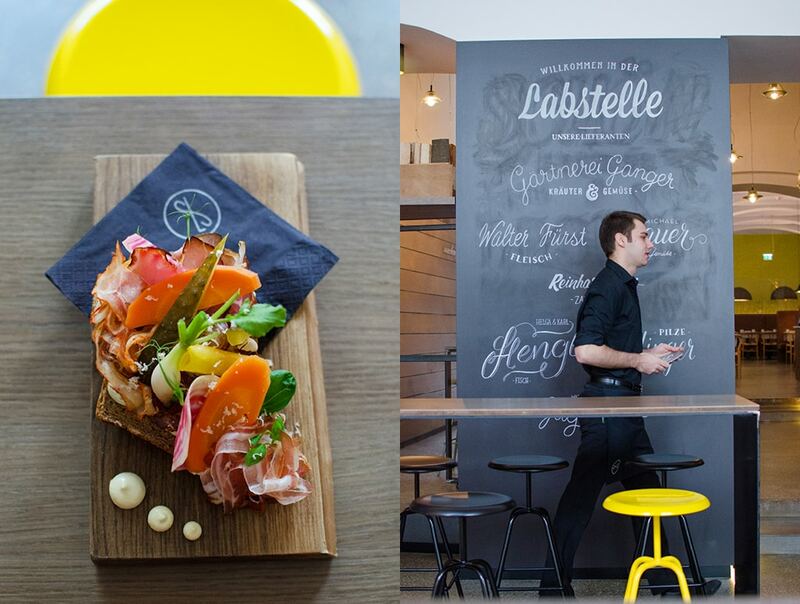 Labstelle has built its reputation on fresh modern design and farm-to-table cooking. Owner Thomas Hahn works with a tight-knit community of purveyors whose names are proudly displayed on a big blackboard in the restaurant’s entry. 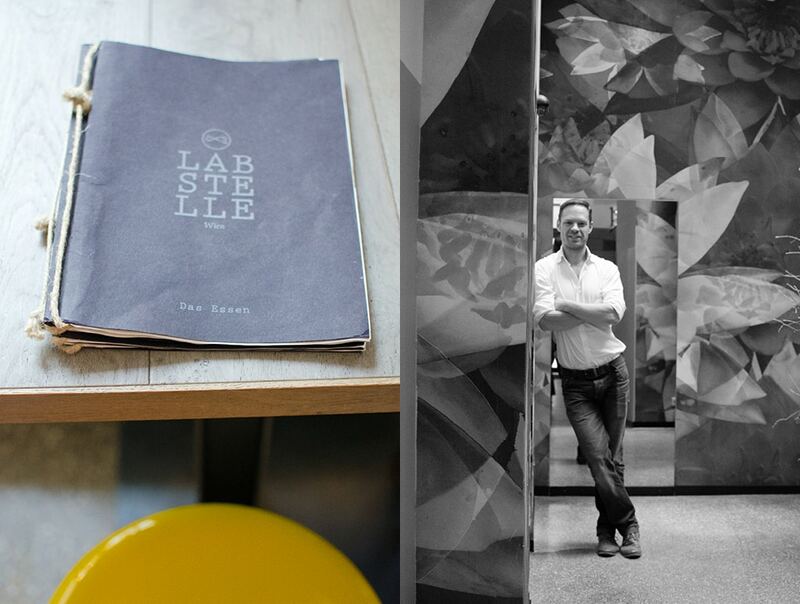 Style, service and modern cuisine are hallmarks of a visit to Labstelle. The young waitstaff is helpful and friendly, and the dining room is outfitted with Danish Modern Wegener chairs, neutrally-toned linen napkins and reclaimed wood tables. 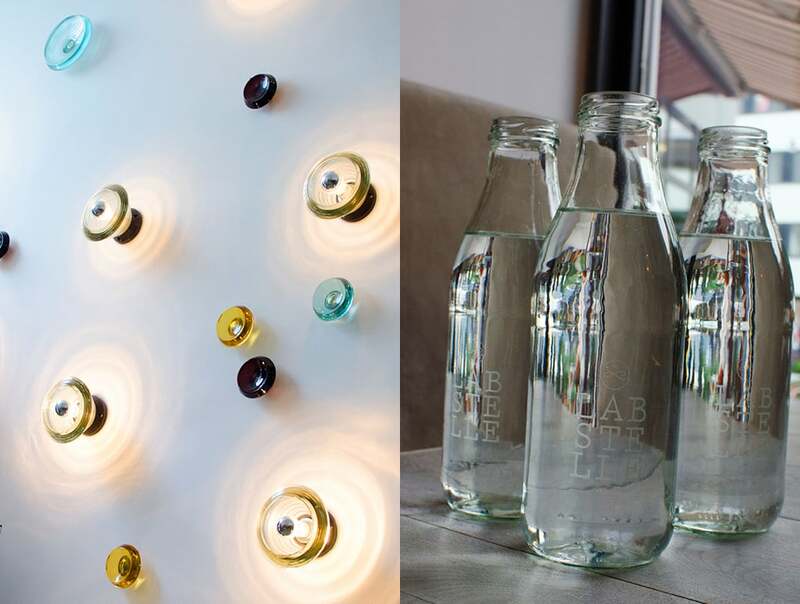 The place is packed full of small, thoughtful, design details, making the space as thoughtfully constructed as the food. The menu is driven by what Labstelle’s purveyors are able to provide on the day, so you are always in for a surprise. In the summer it is nice to sit in the outdoor courtyard – a quiet spot set back from the hustle and bustle of Lugeck Square. 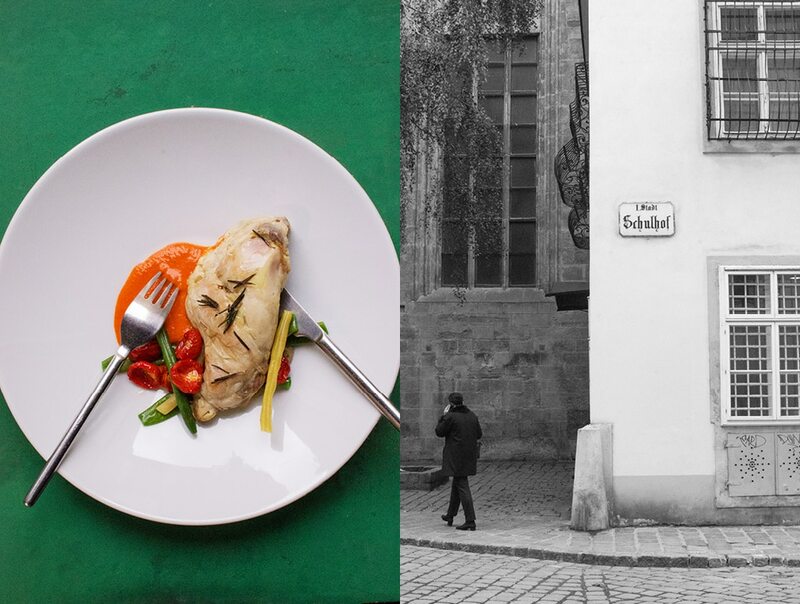 If you have already been in Vienna for a few days, and just cannot face another schnitzel or apple strudel, Labstelle is a refreshing change of pace. On the day of our visit we saw a steady stream of local professionals, visitors and young creatives coming through the door. A sophisticated and diverse crowd, which speaks well for Labstelle’s local reputation. Searching for a special something to bring home from your visit? Purchase a bottle of the house soap that was custom-designed for the restaurant by a young Viennese Soap maker. Feels good and smells great too. We loved it! 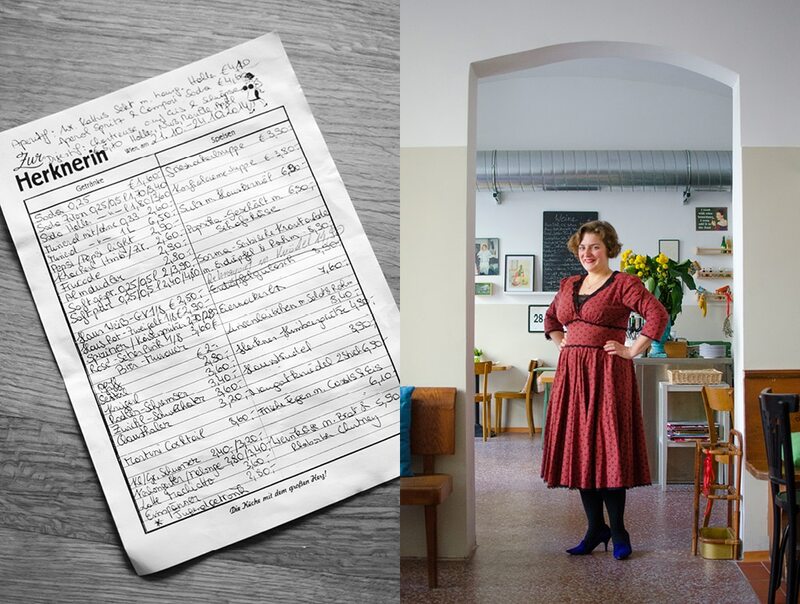 Next we venture into the 4th district to meet Stefanie Herkner, one of the most vivacious and lively chefs I have come across. Full of life, love and enthusiasm, Stefanie abandoned a career in art management and a stint living in London to take over a former plumbing store and pursue her culinary dream. The sign from original plumbing store remains in place above the restaurant, advertising “Installationen” (pipe fitting). It’s a good omen that everything still flows smoothly at the plumbing store’s appetizing successor. 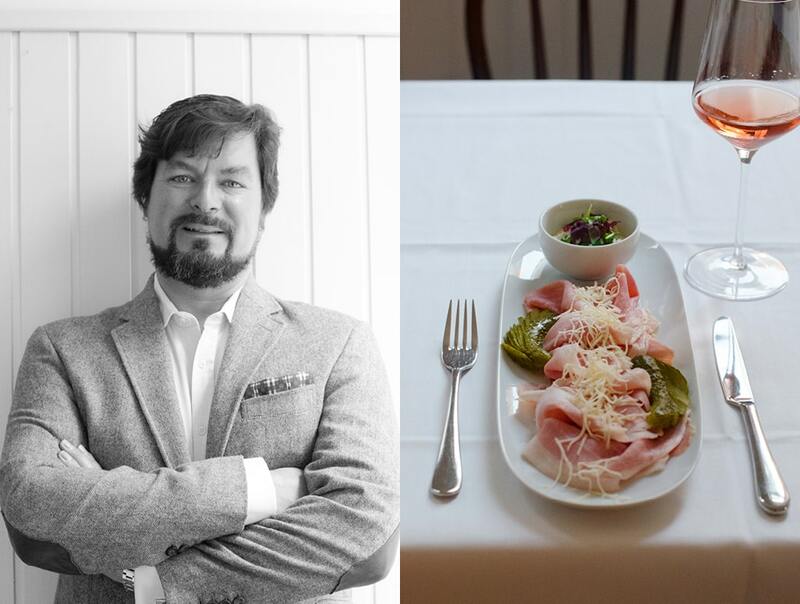 The restaurant business runs deep in the Herkner family. Stefanie’s dad answered to the title “Wirt”, the Austrian term for chef. 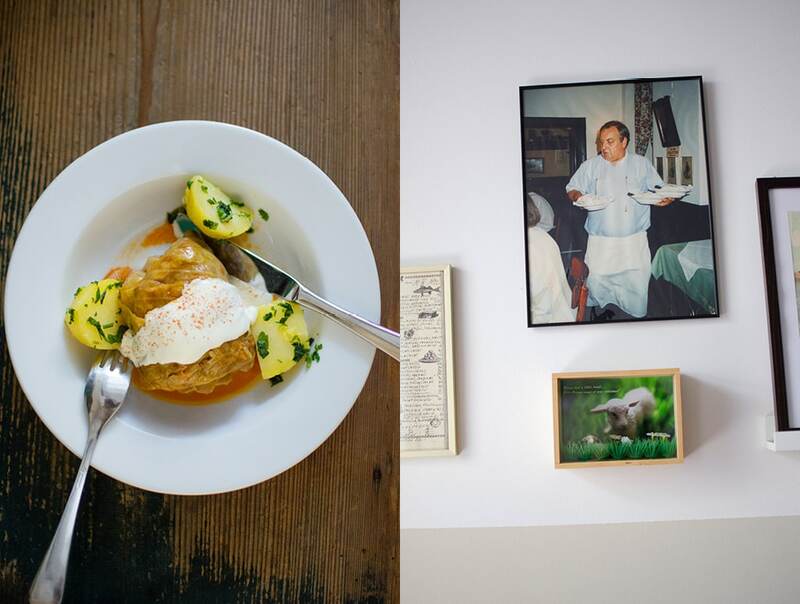 He was famous for his authentic Viennese cooking and is still regarded as a trailblazer for what we now call gastropub culture. Now it’s Stefanie’s turn to bring her versions of dumplings, gulasch and all manner of traditional Austrian fare to the hungry hordes of Vienna. 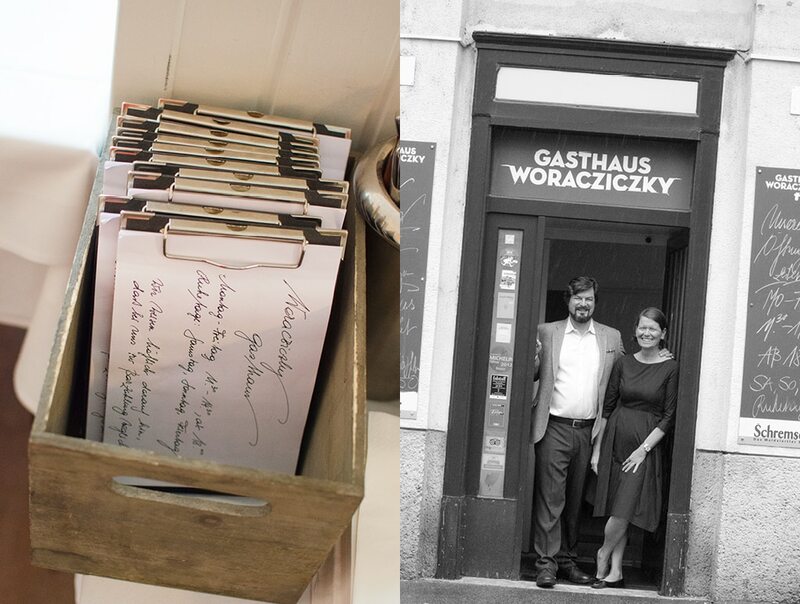 For out-of-towners the fully Austrian handwritten menu can be a little hard to decipher. But plenty of help is on hand to assist you in make your selection, and to advise you on, say, the best wine to pair with spinach dumplings, or Spinatknoedel as the menu might read. 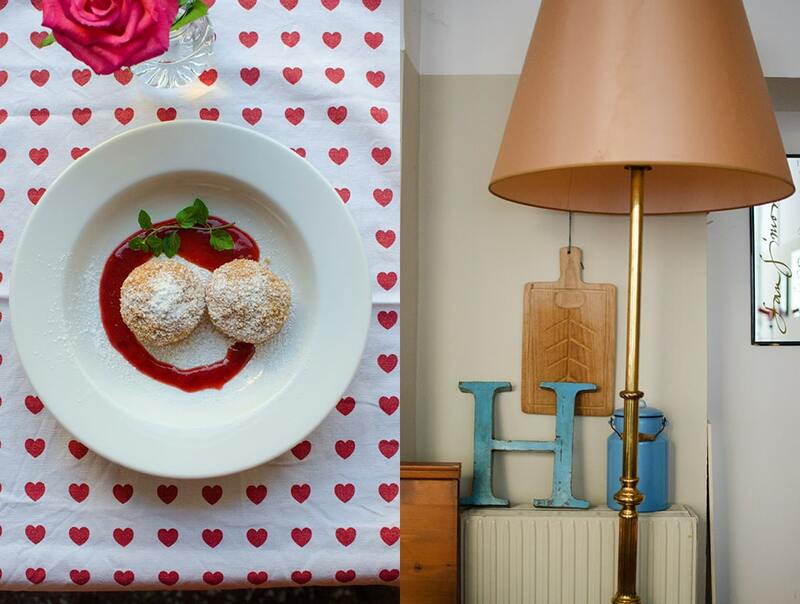 In case you want to learn the art of dumpling making, Austrian style, email Stefanie. She sometimes turns her kitchen into a classroom to educate aspiring chefs on the vagaries of the dumpling. Sounds like a fun activity. I make a pretty mean dumpling but I could definitely use a refresher course. In the summertime Stefanie installs a few small wooden tables out front on the sidewalk. It’s not quite Italy, but quite enjoyable on a balmy Viennese night. Zur Herknerin was a great find and a fitting conclusion to our Eat Vienna Tour. Bon appétit! 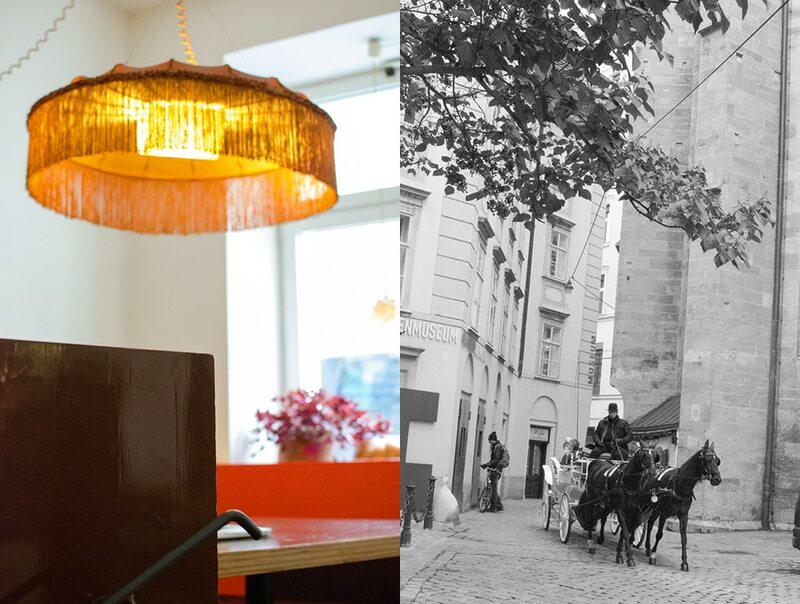 There are a couple of oddities that you might experience eating out in Vienna. Here is a rundown. First, as of the writing of this article many Austrians continue to have a difficult time embracing the concept of not smoking inside public spaces, that most of Europe and the US have now mastered. The Austrian government has made some half-hearted attempts at complying with current EU law on this, but alas, somehow it is not yet working. So if you prefer to eat sans smoke, always check that the restaurant you are going to is non-smoking before heading out. If you are a smoker, Vienna is your nirvana. Second, an issue we came across again and again is that it is rare in Vienna for a restaurant to take credit cards. It is always a good idea to be prepared with cash in hand should the need arise. And last but not least, if you find yourself in Vienna on a Sunday, many restaurants will be closed. You might be left with few choices, and mostly of the tourist variety. Note to self, find some good places to eat in Vienna on Sundays. Planning a trip to Vienna? Here is the current weather and what to expect for the next few days.